This igneous intrusion towers over Wyoming. Devil's Tower, formed by magma, dominates the landscape in Devil's Tower National Park, Wyoming. A timberline is formed at the base of this formation, suggesting that the terrain above is not suitable for the growth of trees. Devils Tower is a 264-meter (867-foot) rock formation in northeastern Wyoming. Devils Tower is made of phonolite porphyry. Phonolite porphyry is an igneous rock, meaning it was formed as magma or lava cooled. As the magma that formed Devils Tower cooled, it condensed into columns. Most of the columns that make up Devils Tower are hexagonal (six-sided). 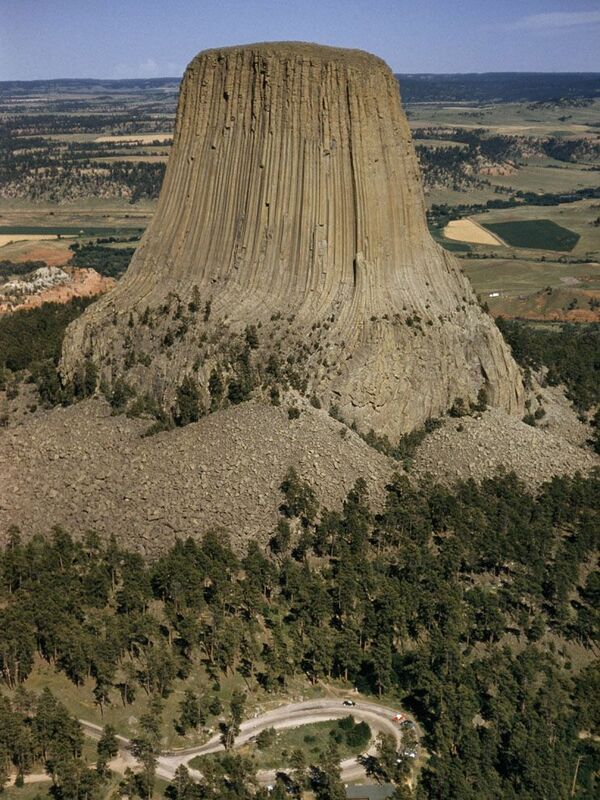 Although magma formed Devils Tower, it was probably never part of a volcano. Most geologists agree that Devils Tower is an igneous intrusion, a place where magma from the Earth's mantle welled up between chunks of sedimentary rock. Devils Tower was probably formed by the same forces that created the Rocky Mountains about 65 million years ago. Devils Tower was not visible for millions of years. Only as water and wind slowly eroded the surrounding landscape did the igneous intrusion emerge. Today, the landscape continues to erode, worn away by wind, precipitation, and the nearby Belle Fourche River. However, Devils Tower is eroding, too. The base of the formation is cluttered with scree—rubble, boulders, and fragments of columns that have broken off the tower. accumulation of broken rocks, boulders, and other material at the base of cliffs or other tall rock formations.